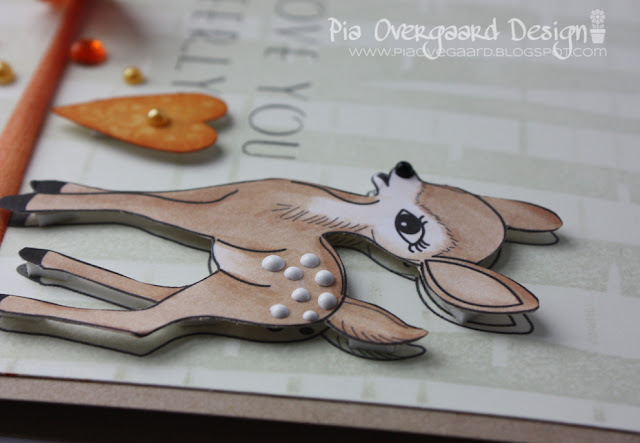 The new color challenge at Lily Pad Cards is sponspored by Tiffany Doodles. 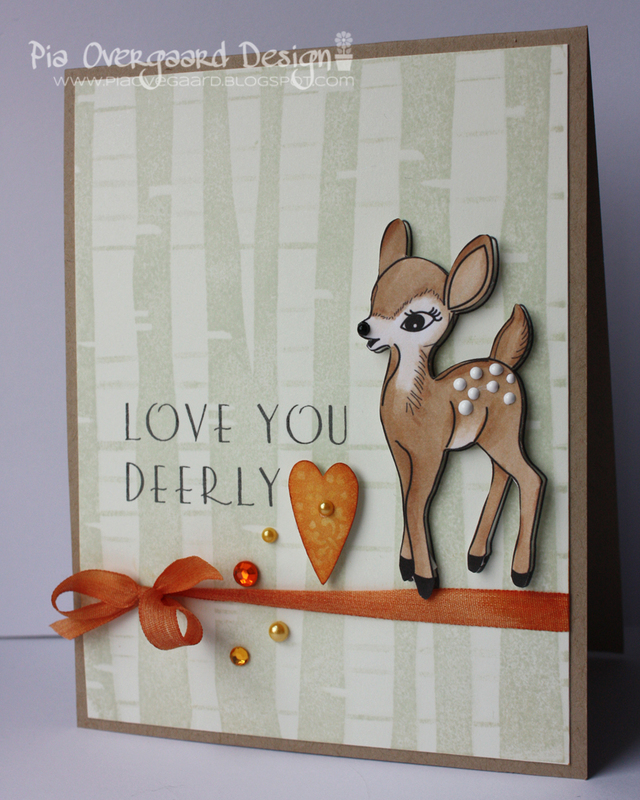 Each DT got to choose a digital stamp and I chose the Fawn Set which includes some very sweet deer images. I used the 3 colors but in a softer tone, especially for the green color, for my inspirational card here. I first sized the sentiment and the Tiffany Doodle image as I wanted - then printed on a piece of copy paper for a guide as to where I should stamp the background. I then stamped the background on a sheet of Hero Arts Eggshell notecard and ran this through the printer again - now printing the images onto the stamped part. I printed the deer image onto white cardstock and colored this in (simple coloring) with copic markers. (it probably wouldn't have made much of a difference stamping after printing with the soft bg - but I was not too sure about it). I used Ranger Enamels (black for the nose and white for the dots) for some added dimension. The yellow color is represented in the pearls/gems. Other: HA gems & pearls, heart punch, May Arts ribbon (colored with Ranger Rusty Hinge distress ink, Ranger Enamel accents, copic makers. Be sure to check out the details about the challenge at the pond for a chance to win a fabulous prize! Hvor er det dådyr bare nuttet. Hvor er det sødt, enkelt og elegant, Pia. Flot fortolkning af farverne. LÆKKERT soft kort. 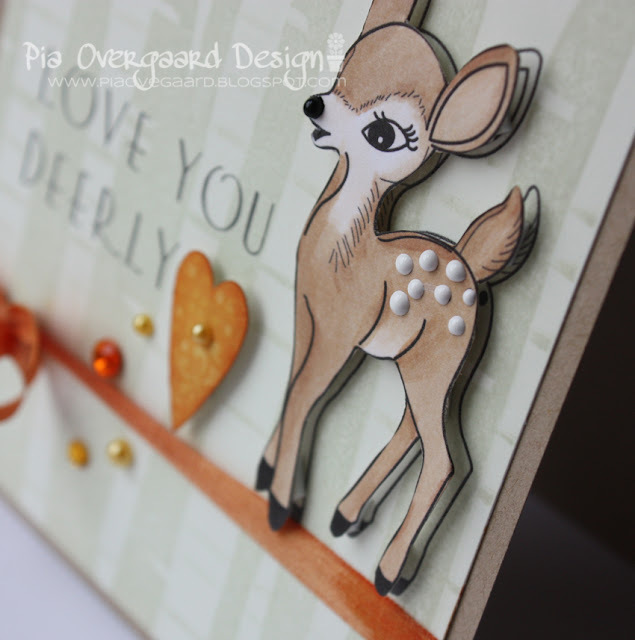 Love the deer! This is so adorable, Pia! I love the soft background, the pretty heart and that little deer warms my heart! Wonderful! I love this, Pia! That deer is super sweet! Oh Pia - sooooo adorable. Love what you created. Your crafting is so beautifully done, so neat and tidy! !